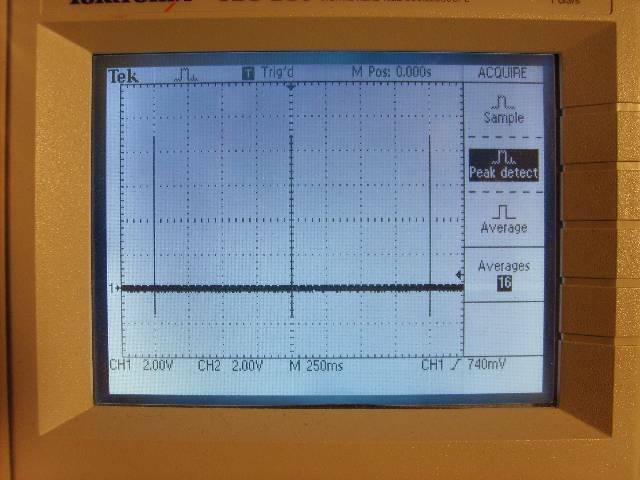 A question came up on Time-Nuts: how to measure the period of a very slow and very narrow pulse train such as a 20nS wide pulse at 1 Hz (1 pulse per second). 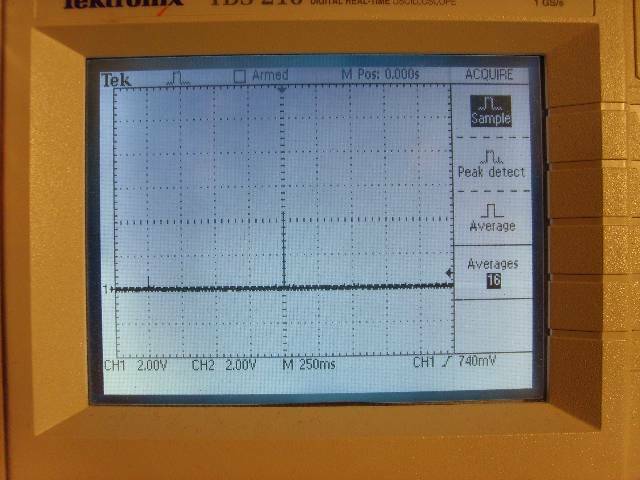 Some Digital Storage Oscilloscopes such as my Tektronix TDS-210, have a "Peak-Detect" mode, or equivalent, where the A/D converter runs at the maximum speed all the time, regardless of sweep speed setting, and the scope displays the min and max recorded in the time interval corresponding to a pixel-width on screen. 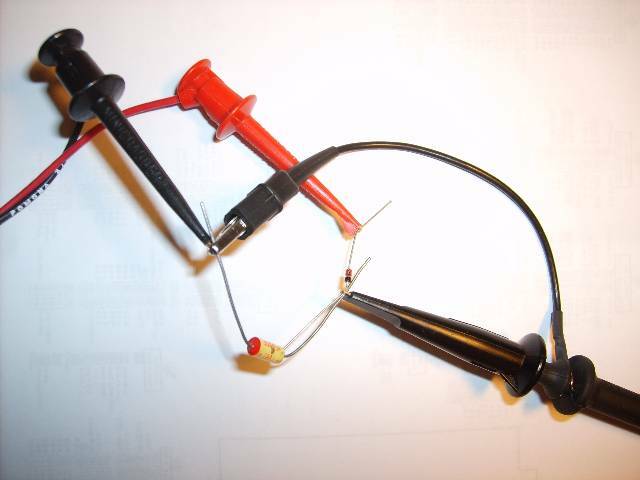 For scopes that do not have that capability, or analog scopes, I suggested using a diode and optional capacitor to stretch the pulse to something wide enough for the scope to display. I took some pictures of my Thunderbolt's PPS output. While it's pulse is not quite as narrow as what was reported (it's 10uS), it's way too narrow for the scope to display it in normal ("Sample") mode at 250mS/div (the fastest setting that will allow to measure the period of a PPS signal) on my TDS-210 digital storage scope. 2_PPS_Sample Mode is the PPS signal in normal (sample) mode, as you probably would see it on any DSO without any special mode. It's fair to say it would be hard to make sure what you are seing or measuring. Please note that some of the time, the scope triggers, but the trace is flat. I had to wait to make this shot, which was the best I saw in about 30 seconds. 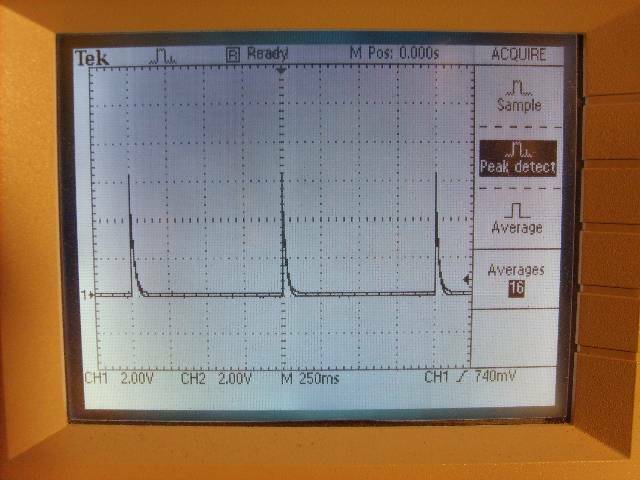 3_PPS_PeakDetect_Mode is the same signal, with the scope in Peak-Detect mode. It is easy to check the period (if not very acurate). In this mode, all sweeps look the same. 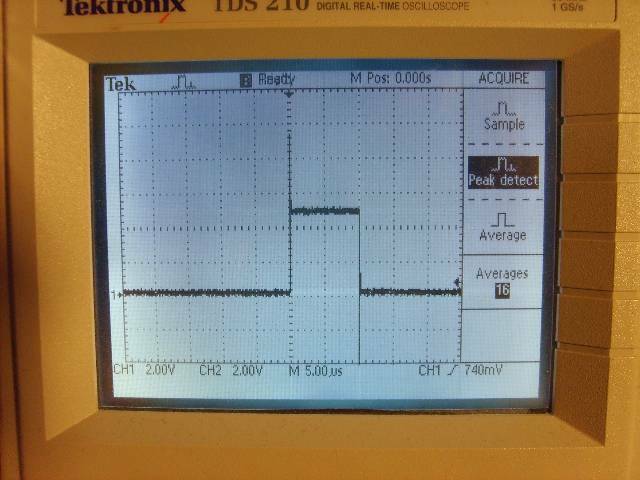 4_PPS_Diode is with a 1N4148 between the PPS output and the scope probe. See how the 10uS pulse is now a solid 250uS at 1/4 the height. It would be much easier to see on any scope, I need to pull the old trusty Tek 2245A and see what it does on it. 5_PPS_Diode_5.6nF is the same diode with a 5600pF capacitor across the probe. The pulse is now strecthed to ~10mS. 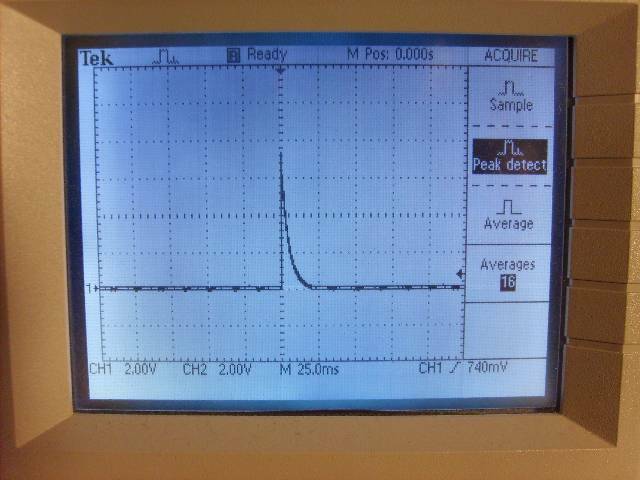 6_PPS_Diode_5.6nF is the same signal at the 250mS/div sweep rate. Note that this picture would look the same if the scope were in Peak Detect mode. 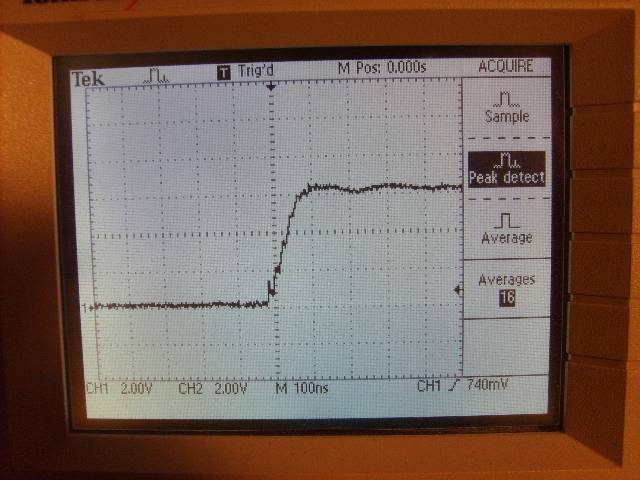 7_PPS_5.6nF_Rise_Time is the rise time across the 5600pF capacitor. At ~100nS, it indicates that a 20nS wide pulse would have its amplitude reduced by a factor of about 4, but would still be very visible. 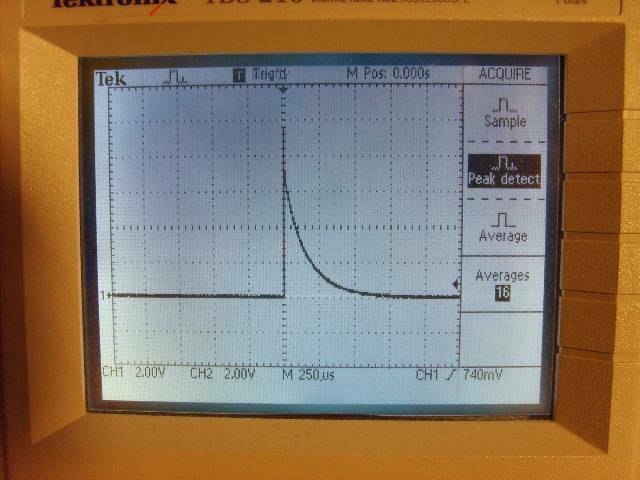 The actual reduction will depend on the diode, the output impedance of the source and the type of capacitor.